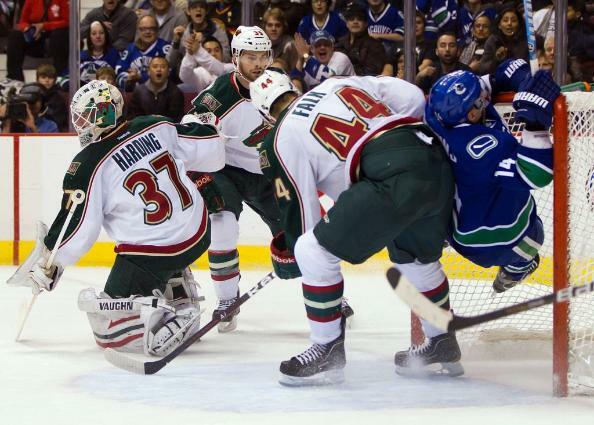 Dallas Stars backup goalie Richard Bachman eked out a win over Vancouver. The former Tiger may get more starts after an injury to Kari Lehtonen forced his entry into the game. Jaden Schwartz scored his first of the year and assisted the next goal to stake St. Louis to a 2-0 lead in a 5-2 win at struggling Calgary. TAMPA, Fla. | Washington Capitals defenseman and former Tiger Jack Hillen left Saturday night’s season opener against the Tampa Bay Lightning after taking a hit into the boards from Vinny Lecavalier. Hillen’s left shoulder hit into the boards after Lecavalier struck him with what appeared to be a clean check. He was down on the ice and in pain until the whistle blew with 8:17 left in the second period. Hillen was attended to on the ice but skated off under his own power, favoring his left arm. Hillen did not return. Coach Adam Oates said the defenseman had an upper-body injury but offered no other update. Hillen, who’s listed at 5-foot-10 and 190 pounds, signed a one-year contract with the Caps in July. He was making his Washington debut. Adam Oates dressed seven defensemen and 11 forwards, so Hillen’s injury knocked the Caps down to the usual six. No penalty was called on the play. Joey Crabb was a healthy scratch. In other former Tigers news, Nate Prosser logged 12:10 in the Wild’s 4-2 win over Colorado. 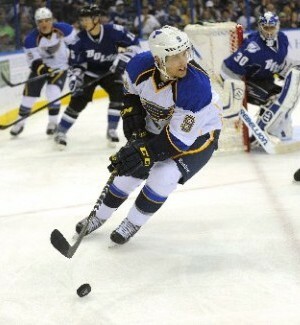 Jaden Schwartz played 11:59 in St. Louis’ 6-0 win over Detroit, , took two shots, blocked two shots and one hit. Winnipeg’s Mark Stuart drew an early boarding call that set up a Jets’ 1-0 lead on a power-play goal. Both Richard Bachman and Toby Petersen, who enters his 13th professional season in 2012-13, his ninth in the AHL, are starting the season with the Texas Stars. 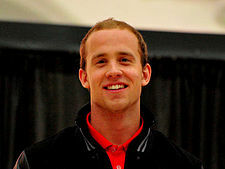 Petersen signed a two-year two-way contract with Dallas on July 2, 2012. Kris Fredheim has five points (four assists) in 24 games with the AHL’s Houston Aeros. Brian Connelly had 22 points (20 assists) in 33 games before a recent injury. Chad Rau has seven points (four goals) in 24 games with Houston. Rookie Jaden Schwartz has wrapped up an impressive camp and figures to be on the Blues’ 23-man roster when final rosters are due at 4 p.m. (St. Louis time) Friday. “He’s available for our selection,” Blues coach Ken Hitchcock said Friday morning. Schwartz, who is playing on the left wing after lining up at center in Peoria, is expected to suit up for Saturday’s season opener on a line with Patrik Berglund and Chris Stewart. 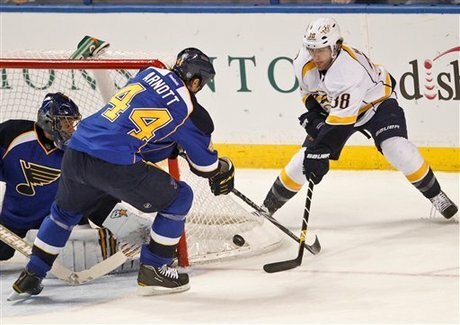 Former Tiger Jaden Schwartz is making a good impression on Blues coach Ken Hitchcock. He is one of a number of young stars according to NHL.com who may benefit from their time in the AHL while veterans played in the ECHL, overseas or tried to stay in game shape on their own. Nate Prosser and Justin Falk look ready to be the Wild’s third defensive pair. Brian Connelly is injured. Joey Crabb took part in this Q&A. Brett Sterling scored a natural hat trick in just over eight minutes during the first period of a 3-1 win for AHL Chicago on Friday night. NHL.com interviewed former Tiger Jaden Schwartz for its regular 10 Questions feature. He has four points (two goals) in seven games with AHL Peoria. Defenseman Brian Connelly has eight points (six assists) in six games for AHL Houston while teammate Chad Rau has three (two assists) in seven games. Kris Fredheim has appeared in two games for the Aeros. For AHL Chicago, Brett Sterling has five points (four assists) in six games while Bill Sweatt has three (two goals) in seven games. Mike Testwuide has one goal in two games so far this season for AHL Adirondack. Gabe Guentzel has appeared in two games for AHL Norfolk. Here is a column focusing on Western Michigan. Games for Friday, November 2: Nebraska Omaha at Michigan Tech (WCHA), 7:07 pm ET; Colorado College at Wisconsin (WCHA), 7:07 pm CT; Minnesota State at Minnesota (WCHA), 7:07 pm CT; Boston University at North Dakota (NC), 7:37 pm CT; St. Cloud State at Denver (WCHA), 7:37 pm CT.
Games for Saturday, November 3: Nebraska Omaha at Michigan Tech (WCHA), 7:07 pm ET; Boston University at North Dakota (NC), 7:07 pm CT; Colorado College at Wisconsin (WCHA), 7:07 pm CT; Minnesota at Minnesota State (WCHA), 7:07 pm CT; St. Cloud State at Denver (WCHA), 7:07 pm CT.
Colorado Springs hockey fans have three good reasons to follow the AHL’s Adirondack Phantoms– natives Jeff Dimmen (Maine) and Ben Holmstrom (UMass-Lowell) and former CC captain Mike Testwuide are all on the Opening Night roster. Dimmen signed an AHL contract after entering training camp with a tryout deal. Holmstrom enters his second season as the Phantoms’ captain. Former Tiger Jaden Schwartz is on AHL Peoria’s second line as left wing with center Phil McRae and right wing Jay Barriball. 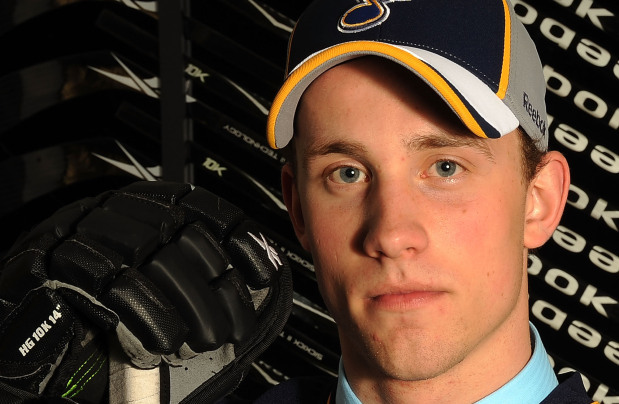 Ted Behrend is on CHL Denver’s roster while Arthur Bidwill made the ECHL Colorado Eagles..
Former Tiger Jaden Schwartz scored two third-period goals to lead the Peoria Rivermen to 4-2 win over the Chicago Wolves in preseason action on Friday in Illinois. The 14th overall selection in the 2010 NHL Entry Draft broke a 2-2 tie at 12:24 of the third after forcing a turnover in the offensive zone with the teams playing four-on-four. He added a second unassisted goal, this one on the power play, with just 1:28 left. He stole the puck from Darren Haydar just inside the blue line and then beat goalie Matt Climie between the legs as he was being pulled to the ice. Chicago’s Bill Sweatt scored a power-play goal against Mike McKenna at 6:14 of the first period.